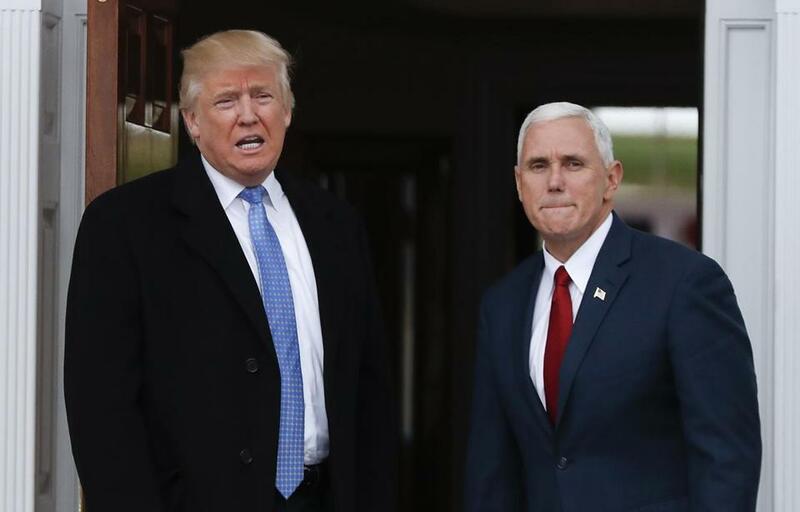 President-elect Donald Trump and Vice President-elect Mike Pence. WASHINGTON — In his first round of Sunday show interviews since the election, Vice President-elect Mike Pence did not rule out the possibility that President-elect Donald Trump would reinstate waterboarding as an interrogation technique during his administration. On CBS Sunday, ‘‘Face the Nation’’ host John Dickerson brought up comments made Saturday by Senator John McCain, Republican of Arizona, at the Halifax International Security Forum. At a panel discussion there, McCain vehemently insisted that any attempt to bring back waterboarding, which simulates drowning, would be quickly challenged in court. Dickerson noted that Representative Mike Pompeo, Republican of Kansas, whom Trump plans to nominate as director of the CIA, supports Trump’s position that perhaps waterboarding should be reinstated. Dickerson then played a clip of McCain’s remarks at the Halifax summit. ‘‘I don’t give a damn what the president of the United States wants to do or anybody else wants to do. We will not waterboard. We will not torture,’’ McCain said, emphasizing certain words with a point of his finger, to applause. ‘‘My God, what does it say about America if we’re going to inflict torture on people?’’ the senator said. Pence seemed unfazed as he watched the video. ‘‘We’re going to have a president again who will never say what we’ll never do,’’ Pence added. Trump said during the campaign that he would reinstate the use of waterboarding against terrorism suspects, a practice that Congress made illegal after its use during the George W. Bush administration. Trump repeated his pledge to bring back waterboarding at another rally a few months later in South Carolina, as well as in several interviews throughout the campaign. However, former House Intelligence Committee chairman Mike Rogers, a Michigan Republican, said after the election that Trump’s waterboarding remarks were just ‘‘campaign talk,’’ according to CNN. McCain, who was tortured as a prisoner of war during the Vietnam War, has long spoken out against extreme interrogation techniques, which are banned under US law and the Geneva Conventions. ‘‘I know from personal experience that the abuse of prisoners sometimes produces good intelligence but often produces bad intelligence because under torture a person will say anything he thinks his captors want to hear — true or false — if he believes it will relieve his suffering. Often, information provided to stop the torture is deliberately misleading. Senator Rand Paul, a Kentucky Republican and one of Trump’s many opponents during the Republican presidential primary race, followed Pence on ‘‘Face the Nation’’ and said he agreed with McCain. ‘‘We should telegraph to the world that we’re better than this,’’ Paul told Dickerson. Pence also appeared on ‘‘Fox News Sunday,’’ where the issue of waterboarding did not come up. Host Chris Wallace raised increasing criticism ‘‘from all sides’’ about Trump and his potential conflicts of interest. Already there have been numerous reports of such potential conflicts. Some have expressed concern that Trump’s many hotels, condos, and golf courses could be venues through which people could curry favor with the incoming president. Last week, dozens of foreign diplomats gathered at the Trump International Hotel in Washington, and at least one said not staying at the hotel might be considered ‘‘rude,’’ The Post reported. Pictures showing that Trump’s daughter Ivanka was present at a meeting last week with Prime Minister Shinzo Abe of Japan also raised questions about the separation between the Trump administration and his business dealings. Trump has said three of his adult children, including Ivanka, will take over his businesses after he takes office.